In the film, the world famous singing sensations are at the height of their musical careers, in great spirits. But life is about to change dramatically for Alvin (voiced by Justin Long), Simon (Matthew Gray Gubler), and Theodore (Jesse McCartney) when Dave, the Chipmunks’ friend-father-figure was accidentally hit by the giant Alvin billboard during a concert. With every bone fractured in Dave’s anatomy, he is forced to stay in the hospital for an indefinite period – leaving the Chipmunks at a loss during his absence. But Dave, being responsible and dependable had immediately made arrangements for Alvin, Simon and Theodore to go to school and eventually fell under the care of his cousin, Toby. Alvin, Simon and Theodore start school with a mixture of enthusiasm and trepidation. 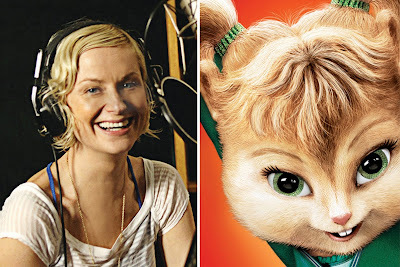 And the adventures really get underway with the arrival in school of three fantastically cute and energetic female chipmunks,The Chipettes namely Brittany (Christina Applegate), Jeannette (Anna Farris) and Eleanor (Amy Poehler) who arrive from Australia and are also trying to break into the music business in Hollywood. The unsuspecting Chippettes go straight to the greedy music producer Ian Hawke (David Cross). 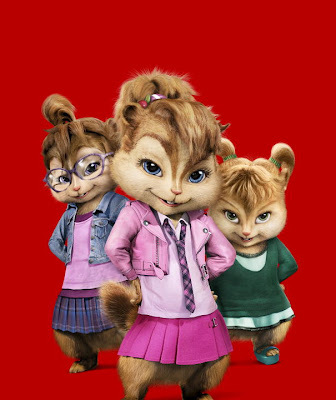 Hawke eventually pits the Chipettes against the Chipmunks and the two singing groups find themselves competing for the limelight in the interschool major music competition. The three Chipettes made their debut in 1983 in the animated series “Alvin and The Chipmunks.” Created (and voiced) by Janice Karman, The Chipettes provided the opportunity for Chipmunks Karman and Bagdasarian to do some “girl songs.” At the same time, The Chipmunks and Chipettes had a fun dynamic, which audiences really responded to. 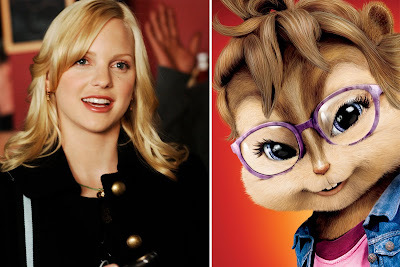 Anna Faris characterizes Jeannette who wears glasses, as different from her siblings. “Her ponytail also reflects her unique, offbeat style. She’s a bit of a dreamer, and not as ambitious as her sisters. Maybe, she’s a bit nerdier than Brittany and Eleanor. She’s incredibly sweet, and has a heart of gold. In some ways, I’m like Jeanette because I, too, can be a little spacey…a little dreamy. And I used to wear glasses,” Anna enthuses. 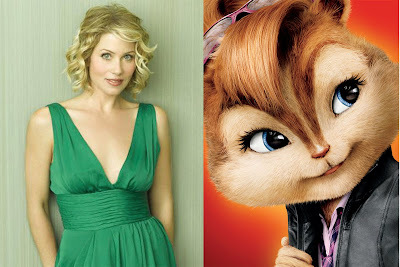 Christina Applegate who voices Brittany is as girl-powered in real life. Applegate is typifies Brittany as the leader of the group and the sassy one. “She’s got some pipes on her, and some moves. Some amazing moves that I’m still trying to figure out on my own!” exclaims Applegate. “It feels great to be immortalized by voicing a Chipette; it was something always on my to-do list. I loved the first movie and wanted to be a part of this one,” concludes Applegate. Applegate starred in the television series “Samantha Who?” for which she won a People’s Choice Award for Favorite TV Female and an Emmy nomination for Outstanding Lead Actress in a Comedy. Applegate’s work in the series also garnered her nominations for a Golden Globe and SAG Awards™. In addition, the show won a People’s Choice Award for “Favorite New TV Comedy” during its first season. Eleanor, the smallest and roundest of the Chippettes is voiced by Amy Poehler who recently lent her voice in the hit family films “Horton Hears A Who” and “Monsters Vs. Aliens.” Poehler describes Eleanor as feisty and energetic. “She’s got an interesting personality. She’s an optimist and knows how to have fun,” says Poehler. “Alvin and the Chipmunks 2: The Squeakquel” opens January 8 in theaters nationwide from 20th Century Fox to be distributed by Warner Bros.